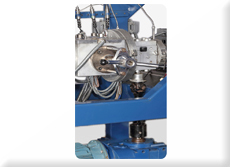 High specific Output rates with Less back pressure. Low Melt temperature with Better dispersive mixing. Excellent Melt Quality with Better physical properties. 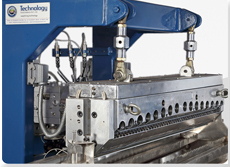 Better control of resin shear stress and melt temperature. 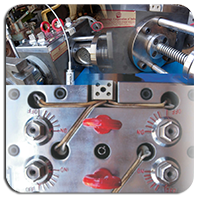 Minimum variation in Pressure and Melt Temperature. Fast Return on Investments ( R. O. I. ). 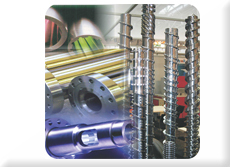 We refurbish all kind of Screws and Barrels Precisely. 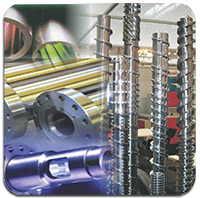 Hard chrome plating with special technology guarantees highest surface quality and flatness, external die surfaces flash chromed. Lip adjustment by the means of pressure screw. 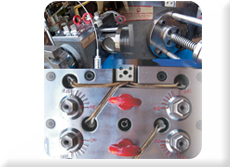 Superior Manifold design without stagnation. Sealed edge designs effectively reduce waste generation. Selected dimensions for optimal mechanical strength and thermal stability. Almost Zero Liner Denier Variation ( Machine Direction ). Money Savings by Controlling Meterage (Weight/meter). Easy Processing of Lower Denier Tapes. Increase in life of Screw & Barrel. Better dispersion of Filler & Color Master Batches. Up to 120mm Diameter filtering Area and 900 Kg/Hr Filtering Capacity. Very compact & precisely made for leakage free Performance. Special chrome and nickel plating gives protection against wear out. Filter Cartridges can be cleaned and replaced without stopping the plant. Minimum consumption of screens because it is getting clean by itself. After complete obstruction, require to replace. More production because zero shut down for screen change. Very less Wastage (as good as zero) while Screen Changing. Save Power on a/c of Heat Loss during Screen Changing. 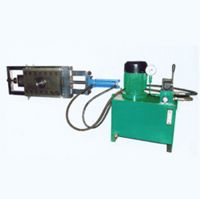 The Hydraulic Screen Changer is suitable for reprocess kind of extrusions like Lamination Plants, RP Plants, Filler & Master Batch Plants, Compounding Plants etc…, where highly contaminated kind of materials are processed. Our Screen Changers are very precisely made for guaranteed leakage free Performance. Comes with energy efficient and most power full power pack. By this screen / station change is possible within less than 3 seconds. 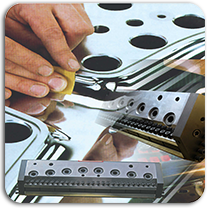 Once the Hydraulic system started, hole-to-hole screen changing can be quickly accomplished without wasting production. Built-in Heaters gives fast heating and superior temperature retainment. 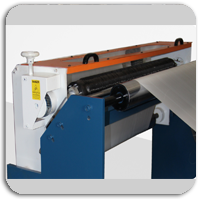 Ensures Quality processing, high product quality and reduced waste materials. with low Maintenance and low cost spare parts. It is most reliable and durable, as it is made by a steel body for long life. The special chrome and nickel plating gives high protection against wear out. Easy to Install and Easy to operate on-line. You will save Money, as It reduces the consumption of Blades by using Multiple Face (Point) of Blade. Worn Blades can be replaced by another one without stopping the plant. 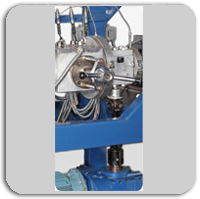 It gives guaranteed continuity in processing and maximum utilization of the plant. More production because zero shut down for Blade change. Save Money on Wastage of Raw Material during Blade Changing. Save Power on account of Heat Loss during Blade Changing. G-20, Vijay Plaza, Opp. Abad Dairy, Kankaria, Ahmedabad, Gujarat, India. © 2018 Technology Plastomech Pvt. Ltd. . All Rights Reserved.